Clear and vivid simulation of the movement of the sun, moon and planets from a geocentric point of view. For any time in the year and any location on Earth. With this beautiful desktop planetarium you can easily visualise the movement of Sun, moon, planets and fixed stars above and below the horizon for any location on Earth and any day of the year. 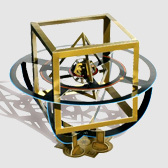 A real gem, not only as an astronomical instrument and teaching tool, but also as a fantastic showpiece. 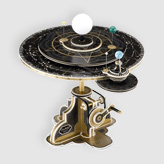 The first ever fully functional cardboard orrery!